Many years ago, I bought a Sony Clie (a PDA much like a Palm Pilot), at first, I used it a lot, but then as I had kids it was one more thing to carry around and I stopped using it for a while. Fast forward a few years and technology has changed, and the phone/PDA combo devices are much better, so I take took the plunge a few years ago when I upgraded my phone and got a Palm Centro (it's a cell phone but runs PalmOS operating system so I can use many of the applications I used on the Clie). It's a few years old now, but I still love it. HandyShopper - this is a database program, originally designed to do shopping lists, which is what I mostly use it for. It let's me organize things by store (and aisle if I want) and can keep track of the prices things cost. I also have a separate database for gift ideas, so when I'm struck with a gift idea, I can note it down and remember it later. Countable - I knit and crochet. Lately since I have so little time, I do a lot of it when I'm in the car travelling (hubby's driving). Countable is a counter that let's me keep track of rows, increases, decreases, pattern repeats etc. Mostly I just use it as a row counter. With kids, I get interrupted a lot while I'm knitting. Bible+ - The Bible on my cell phone, so I can have it with me all the time. I can download different translations, jump to book and verse, and search for keywords. Even see different translations in parallel. Memorix - I stumbled on this one this past Christmas. It's a memory game where you "turn over" the cards and make matches. Great to entertain the kids when we're waiting in the store, at a restaurant, etc. IM+ for Skype - I'm not sure if you're familiar with Skype, but it's a service that allows you to make phone calls from your PC. If you're calling to someone else who has Skype, it's free. There's also a text based chat/IM method of communicating. (I think I might talk about Skype next week, tune in!). We use it a lot at work, since our offices are spread out, we need to do a lot of conference calls and we use the chats a lot when we need to ask quick questions of each other. IM+ for Skype isn't made by the people at Skype, but they don't have a PalmOS client, so I had to turn elsewhere. It's nice because I can answer questions from my employees while I'm away from my desk (ex when I'm at the pediatrician's office with my kids). IM+ for Skype is one of the few programs I've actually purchased for my phone. Pocket Quicken - Pocket Quicken is the other program I've paid for. It's a version of Quicken (accounting/financial software) for Palm OS. Hubby likes to keep track of all our expenses, receipts etc. I was TERRIBLE with loosing receipts and not getting them to him. I'm still bad when I'm in a hurry, but with Pocket Quicken, I can enter them into my phone right away or while I've got a spare minute and then Hubby just sync's my phone with his system (which has the full version of Quicken on it) and imports the data. He's much happier now :) Unfortunately, it wasn't made by Intuit and Intuit has terminated their agreement with the company that was making it, so you can't get new versions that work with current Quicken software. Unit ConPro - At work, I frequently need to convert between bytes, megabytes, gigabytes with byte accuracy (1 GB = 1073741824 Bytes) I could memorize the numbers, I could use the calculator in Windows, or I can use a unit converter like Unit ConPro (I also use the WWW Unit Converter, but lately ran into a bug with it). It also will do conversions for Volume (cups, pints, teaspoons, etc) which comes in handy when you're doubling recipes, or trying to figure out which item at the grocery store is bigger. It also does a whole pile of other unit conversions. If you can think of it, I bet it does it! pssh - An ssh client for PalmOS. For us tech folks. I don't use it often, because most of the systems I need to ssh to aren't accessible via the internet and I don't want to install a VPN client on the phone (although they are available). Documents to Go - I actually don't remember if I paid extra for this (I did for my old Sony Clie) or if it came with my phone, but this allows me to create/edit Office documents (Word, Excel, PowerPoint and plain text). It also allows me to view pdf files. 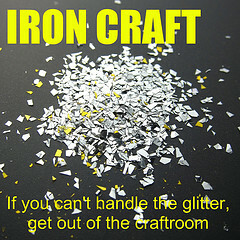 I mostly use this for recipes. I've got recipes that I store as plain text files on my computer and when I'm planning on making one, I put it on my phone so I don't need to print it out to make it. You can also get some books from Project Gutenberg in plain text, although I find them a little hard to read that way. Google Maps - We don't have a GPS, but I can get easy access to Google Maps from my phone and it can approximate where I am (based on which cell tower I'm using), sometimes with better accuracy than others. But it's nice having access to the maps that Google provides when I'm out and about. The other software I use is stuff that came with it, mainly the email client (which does pop and IMAP, although I've been having issues with it lately), the web browser (nothing special really), and the MP3 player (which I talked about on my audio book post). Overall, my Centro is really working for me. I'm hoping that there will be another good PalmOS based phone out when I'm ready to replace this one. 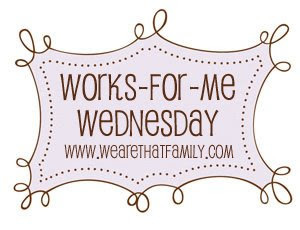 Check out other Works for Me Wednesday posts at Rocks in My Dryer. I'm getting back in the swing of blogging, now I need to start picking up the other things that I dropped at the same time. Mainly reading my Bible daily. I'm going to add that back in today. Please pray for me, that it'll be easier to stick with it this time. The theme this week is Yellow and truth be told, this was a meal from last week, but I wanted to post it before I forgot that I had it and since it didn't go with the theme anyway, I figured I'd just do it. 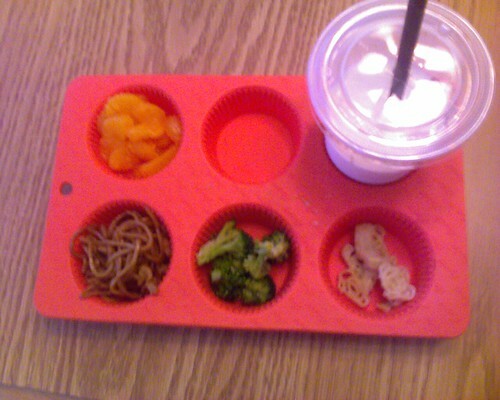 Mandarin oranges, chicken Lo Mein, broccoli, pasta alfredo and an open spot for cake once everything else was gone. It doesn't look very appetizing, but the kids sure ate it ('course maybe the cake was a pretty good incentive! ). Head over to Muffin Tin Mom for more great Muffin Tin Meals! Once I stop something that used to be a daily habit it's very easy for me to let it go and never do it again. I'm afraid that's what's happenned with the Love Dare, illness hit my family and then by the time it was over, I was out of the habit and I never got around to starting back up, until today. But, I really do want to finish the Love Dare, even if it does take me twice as long to finish as it should. So, I'm going to pick up where I left off and make it a point to go back and review what I've done this far. This is something hubby and I have talked about a bit in the past, I have a tendency to ask other people opinions on things, particularly that of my father and brother before his. After we talked about it, I have tried to work on it, but it's obviously something that still needs some work. He doesn't seem to have as much of a "Lingering" issue with his family. Sometimes I wish he was a little more close with them. Dominoes - This can teach numbers, counting, color matching, etc depending on the set of dominoes that you have. We have a Care Bear set and a standard dot set (the different numbers of dots are also color coded). I really want to do an alphabet set, but I'm waiting for hubby to cut the wood. Boggle - I got boggle for my 6 year old at Christmas. She loves it. I don't know if you've seen it lately, but now it's all self-contained, even the non-travel version, so there aren't any loose pieces. She was even playing by herself, mixing the letters up and then trying to form words. It's not something my 3 year old can play though. Scene It - We have the Disney version and it's a favorite of both my kids because you can watch little snippits of movies and they love movies. I like it because you can fold the board differently to adjust the length of the game for the nights when there isn't a lot of time. Memory - Fun for all ages. There are different versions out there, some with different shaped cards for younger kids to make it a bit easier. My brother used to love playing memory with a regular deck of cards. Over at Mind Games, they're having a contest for another game that's fun for all ages. The game is called Walk the Dogs and looks like it would be a lot of fun to play. Go check out the contest and while you're there, take a peek at some of the other great stuff she has on her blog. Lots of great activities for kids!